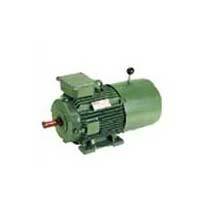 We are reckoned as a prominent Manufacturer and Supplier of an impeccable Brake Motors,. Manufactured using superior quality raw materials, our Brake Motors are highly efficient and support smooth functioning. These Motors are made by using optimum quality raw materials sourced from the most reputed and trusted vendors. Due to their excellent features our Brake Motors have a wide application in various industrious for diverse purpose. We further make our Brake Motors available to our esteemed clients at very moderate price. Textile Machines, Material handling equipments, Conveyors, Machine Tools, Cranes & Hoists, Glass Manufacturing Machines, Geared Motors, Wire drawing machinery, Sluice Gates, Cable reeling drum, Navy Deck Machinery, Leather processing machinery, Steel rolling mills, Special purpose machines, Defense equipments, etc. Brake Motor is combination of an AC induction motor and an electromagnetic DC fail safe brake. Brake coil connections are shown at AC side AC switching is recommended when braking time is not critical. Switching is carried out on DC side. Once braking of the motor takes place intermittently, DC switching must be carried out. A Resistor and Capicitor network must be connected across the brake coil and parallel to it. Application details and mounting method. Duty cycle with number of starts/stops per hour. Solid state AC to DC rectifier will be supplied separately. Brake motors with flame proof/crane duty/textile duty specification can also be offered on request.